« Healthcare Special Interest Group – The Implementation of “Digital” Into Your Overall Marketing Strategy. 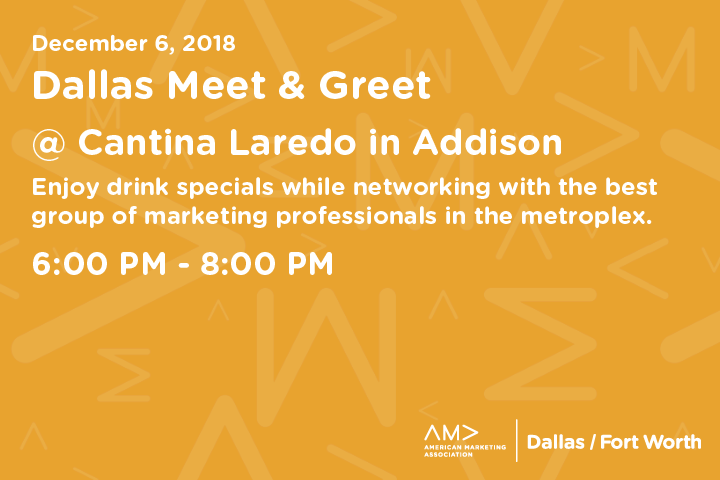 You don’t want to miss this exciting Meet & Greet at Cantina Laredo in Addison. Enjoy drink specials while networking with the best group of marketing professionals in the metroplex. Reserve your spot online. Walk-ins will be accepted based on availability. AMA DFW Members: To recieve your FREE member ticket, select Enter Promotional Code, type in your member number, without the leading “0” and click Apply.